Fitnessform X10 2-in-1 Cross Trainer & Exercise Bike - SPACE SAVER - Super Compact - Super Lite (30KG / 98(H) x 23(W) x 45(L)CM) - Easy removable Seat column & Console column + saves valuable living Space - Call Customer Care TODAY on 020 8123 4392 for details + Multi Action Adjustable Swing arms, horizontal vertical seat adjustment + Maximum: 110kgs User weight capacity + New Summer 2015 ergonomic cross trainer design. 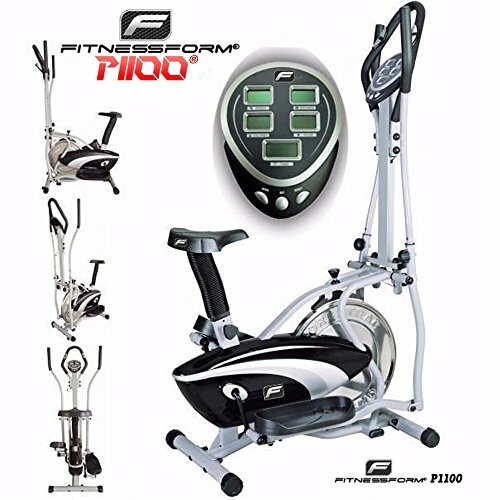 The Fitnessform Cross Trainer 2-in-1 fitness elliptical exercise bike is a machine designed to give you an all-round workout. The ergonomic cross trainer design has multi-action adjustable wing arms, while vertical seat adjustment allows for users of all heights. This machine is noted for being a low impact one, making it particularly gentle on your joints. After a large discount at Amazon, this machine is in the low to mid-price range. To keep track of your progress, you’ll find an LCD display displaying the usual information such as time, speed, distance and calories, while integrated sensors also measure your pulse. The display is a particularly large one, showing all this information at the same time, in five separate mini windows. To customize your workout you’ll have the option of changing the resistance using the adjustable knob. Coming in at just 102cm in length, this equipment is certainly a space saver, while at a weight of just 30kg, this is easily transportable, aided by the roller wheels on the footplates. The seat column and console can be easily removed if wanting to enjoy the cross trainer aspect of the equipment only, while the footplates ensure there is no slippage. Reviews of the item have been almost unanimously positive. The assembly has been described as straightforward, taking around 40 minutes, although one reviewer did state that the instructions could have been a little clearer. The unit is said to be well made and sturdy, while also being portable too, one reviewer delighted that they had lost a couple of stone using it, while it looks great too (this item comes in impressive black or grey colour schemes).